Railpictures.ca - John F.Bromley photo, Dan Dell'Unto coll. Photo: A warm June day in 1961 finds TTC A8 PCC 4527 taking on a load of passengers at the southeast corner of Bathurst and King Streets, working the “Fort” route north to St. Clair. The Fort car was a branch that operated along Bathurst between Fleet Loop (on Fleet St. west of Bathurst), up Bathurst to Woseley Loop at Queen St., or up to St. Clair Avenue as this car is signed. The A8-class of all-electric PCC streetcars were a group of 50 numbered 4500-4549. 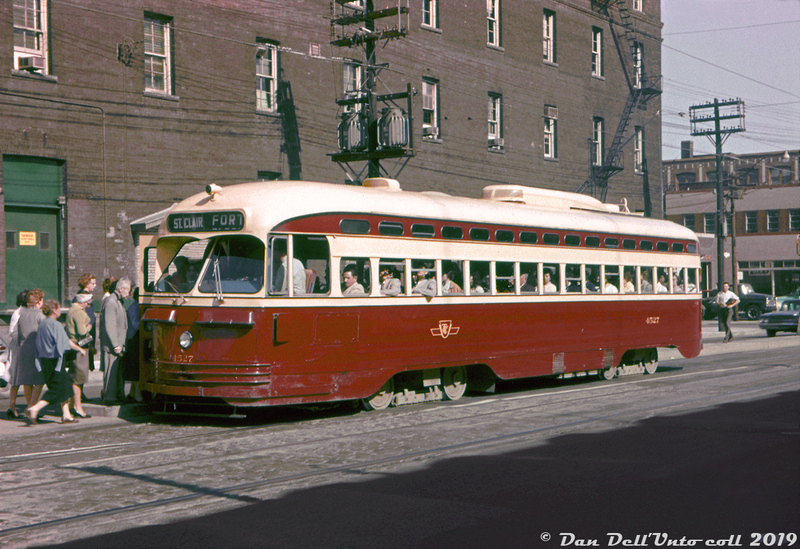 They were Toronto’s “newest” PCC’s, being built by CC&F in 1951, and also the final order purchased new by the TTC (various groups of used cars would be purchased in the following years). While Toronto’s once-mighty PCC fleet was being phased out in the 80′s with the delivery of the new CLRV & ALRVs, a select group of 19 A8′s would be rebuilt into 4600-series A15 cars for operation on the new Harbourfront LRT that opened in the early 90′s, and most of those rebuilt cars survive today at various museums and tourist operations, including two retained by the TTC for special events. John F. Bromley photo, Dan Dell’Unto collection (this was an old Ektachrome slide that had basically fully cyan-shifted, a good amount of digital TLC and tweaking was needed to help bring the colours back). | Railpictures.ca – Canadian Railway Photography – photographie ferroviaire Canadienne. Copyright Notice: This image ©John F.Bromley photo, Dan Dell'Unto coll. all rights reserved. Caption: A warm June day in 1961 finds TTC A8 PCC 4527 taking on a load of passengers at the southeast corner of Bathurst and King Streets, working the "Fort" route north to St. Clair. The Fort car was a branch that operated along Bathurst between Fleet Loop (on Fleet St. west of Bathurst), up Bathurst to Woseley Loop at Queen St., or up to St. Clair Avenue as this car is signed. The A8-class of all-electric PCC streetcars were a group of 50 numbered 4500-4549. They were Toronto's "newest" PCC's, being built by CC&F in 1951, and also the final order purchased new by the TTC (various groups of used cars would be purchased in the following years). While Toronto's once-mighty PCC fleet was being phased out in the 80's with the delivery of the new CLRV & ALRVs, a select group of 19 A8's would be rebuilt into 4600-series A15 cars for operation on the new Harbourfront LRT that opened in the early 90's, and most of those rebuilt cars survive today at various museums and tourist operations, including two retained by the TTC for special events. John F. Bromley photo, Dan Dell'Unto collection (this was an old Ektachrome slide that had basically fully cyan-shifted, a good amount of digital TLC and tweaking was needed to help bring the colours back). 1. As usual the “arms out the window” despite the warning on the inside. 2. Driver’s chair. It’s not a Recaro, but boy, no slouching there. Ramrod straight.